Note: Years ago, I was using a strategy to build passive income where I was buying and selling websites. I don’t do it anymore, but if you’re interested in applying these same methods to improve your cash flow, read the rest of this article to see what I did. The reason why I decided to go looking to buy websites was because I was not satisfied with the income I was generating from blogging. I was making about $2,000 to $4,000 per month, no small amount for most bloggers, but I was still frustrated with the slow growth that is the nature of most blogs. I wanted to use the revenue generated from blogging and reinvest it to accelerate my income growth, but I was wary of increasing my labor as a result of any purchases. I had already experienced what happens after buying another blog when I acquired SmallBusinessBranding.com. For the months that followed the purchase of Small Business Branding I came to a very clear understanding that while buying additional blogs can increase your income unless you come up with an alternative content model to writing it all yourself, you end up significantly increasing your workload. There is only so much blogging one person can do, and if you read through the archives of this blog you will see I have thought considerably about using blogs as a passive income source and eventually changed the structure of Small Business Branding to reflect a better model (see How To Outsource Your Blogging for details and also my series on professional blogging as a sustainable business model). With my previous experience I decided that for my next website purchase I wanted something that was a pure passive income source (or as close as possible) and preferably was so from day one – I didn’t want to have to hire any people to produce content or perform any significant ongoing roles myself after buying the site. I’ve always loved sites that grow because of the existing user base. 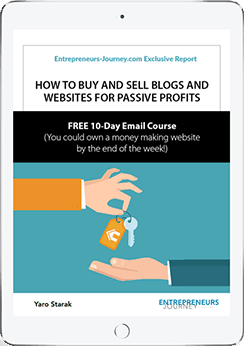 If the people who use your website also create the content, thus generate the value, and even better – spread the word (market) for you – then you have the perfect formula for passive income. Forums are one of the best and simplest examples of a user generated content site, but unfortunately forums are notoriously hard to monetize and take forever to gain traction if you start them from scratch. However I knew, based on my previous experience owning a forum, that I could make them work and as a result I focused on locating forums as my main site acquisition targets. For a few months I monitored the Flippa Marketplace on a casual basis, occasionally bidding on sites, but nothing was compelling enough to purchase. I had a rough price range that I was willing to shop within of around $2,000 to $20,000 since I had that much money disposable for purchases, although it would have to be something special if I was to invest $20,000. I was part of the bidding process for some high priced sites, including BlogExplosion when it went up for sale that I was willing to spend as much as $50,000, but it sold for a lot more so I missed it. One day while checking in at Flippa I came across an auction for some sites that appeared to match my criteria. They were forum based, required little ongoing maintenance and best of all, were already revenue producing to the tune of roughly $1,000 per month. Generally with sites that match my criteria, they match the criteria of a lot of other buyers as well, so unless you act fast you often miss out on the best deals. Each time I have bought a site or nearly bought a site it’s been because I decided quickly and then acted quickly. There’s a risk involved of course, so I always suggest spending money you can afford to lose when investing in web property. Thankfully with my line of work I can monitor Flippa during the day, conduct research on sites quickly and be at the point where I am making an offer within thirty minutes of seeing an auction. Usually I like to contact the seller directly and see if I can offer them a buy-it-now (BIN) price for an immediate sale so I don’t risk being outbid. This can result sometimes in paying a bit more or a bit less, depending on demand, but it helps to ensure you get the site. The niche forums in this case were advertised with a BIN price of $12,000 Australian dollars and were bidding around the $8,000 mark, although there was a lot of time still to go when I came across the auction. Luckily for me, this buyer was qualifying the auction as only for Australian buyers because of the need for an ABN (Australian Business Number) in order to take over ownership of the .com.au domain names. As one of the few Australian bidders on Flippa willing to invest multiple thousand dollars in a purchase, I knew I had a good chance of landing the sites if I moved immediately. I contacted the seller, initially via private message and email, then had a discussion over the phone to make sure things were legitimate and I was dealing with an actual person. I did some due diligence, checked the stats and reviewed the archive history of the sites. Everything checked out so I went with a buy it now offer of $12,000 AUD, broken down into two payments of $6,000, one at the start of the month and one at the end, to make sure I could verify the traffic and income before finalizing the deal. I considered the price reasonable for sites bringing in $1,000 USD per month – I didn’t get a bargain based on Flippa standards, but in the offline world if you could invest $12,000 to get a 10% MONTHLY return you would jump at the chance. Miniriders – Mini dirt bikes and pit bikes forum which now has 7,000 plus members, 600+ active members and usually has around 40-50 members on the site at any one point in time. Pocket Bike Racing – A pocket bike community forum with 6,000 members, 200+ active members and around 25 members on the site at any point in time. When I purchased the sites, this forum was the main feature, but Miniriders was growing like crazy after I bought it and it became the leading forum in the package. Mini Bike Videos – A little YouTube style video sites just for mini bike videos. This site was sort of a bonus thrown in, although it does make a few dollars a day from AdSense. I had some ideas on how I wanted to further increase the income from the sites, but for the moment my main concern was putting in place a manager to look after them and ensuring things continued smoothly. I was well aware that I should not put too much of my own time into keeping the new sites going. My focus was still blogging, but I wanted to have some additional passive income too. Robert Kingston had come on board to help out with the blog I purchased earlier, Small Business Branding, initially as a writer, then as head editor and manager. I offered Rob the chance to come work with me on the new bike sites I had just acquired in exchange for a share in the revenues. Rob eagerly agreed. Rob and I made some changes to the bike sites over the months after the purchase to make sure they would run smoothly. Rob made sure there was an active moderation team and got a feel for how the communities operated. We moved the sites to my servers and then went to work to increase revenues. At the time AdSense and Linkworth were the only income sources that sites had, with AdSense generating about $800-$900 a month and Linkworth around the $50-$150 range. I knew the sites had a ton of income potential, in particular I thought long term, just having a list the size of the memberships made the sites a bargain, but first we decided to work on the “low hanging fruit” monetization methods that could be implemented quickly. This is an area I know quite well having monetized my blogs and before that, my first successful online venture was a forum site for Magic players in Australia that made money from advertising. I wanted to set up private sponsors, so I asked Rob to implement a few basic things, like an advertise section and to contact any likely sponsors, who were easy enough to locate because some of the retailers who sell bike related products are members of the forums. After some initial hiccups because I over priced the advertising packages, Rob sealed some deals with three sponsors, each paying $150 a month, adding another $450 to the monthly revenue. As a result of the new monetization techniques we implemented, the sites grew from around $1,000 a month to around $1,500 to $2,000 on a reasonably consistent basis. My goal was to grow the income to $2,000 a month although I believe if I really focused on the sites, for example by starting up blogs and adding an email newsletter to each forum, the income could be as high as $5,000 month (with added expenses though) given the size of the communities. At the moment I’m not doing much more with the sites other than keeping them going. Rob watches the communities daily and every now and then we test new monetization methods. My mind is not on these sites although I haven’t considered selling them off either because I believe the longer you hold on to healthy sites the larger they grow, and since they are cashflow positive, there’s no compelling reason to sell. By the end of this year I should have made back my investment cost. This is a great example of a website buying process that went well. If you take action quickly, do your due diligence before buying, and know how to monetize websites or are prepared to learn, then this is one of the easiest ways to get into making money online. Let’s pretend I wasn’t a blogger and instead became virtual property investor. With the bike sites I could have started with a $12,000 investment, bought the sites, worked on them myself and with a few short months created a stable $2,000 a month income source, which for a lot of people is enough to live off. From there, I could reinvest in more property or focus on growing the sites to increase revenues. As I said in my last article on buying and selling websites – this is one of, if not the easiest way to get into the Internet business game and it’s darn speedy too if you have the funds to invest or know how to strike a deal using other people’s money. If I ever grow tired of blogging, you can bet what I will be doing to make my living is buying and selling websites. Great information, fantastic article. You know what makes your site so much better then the one million want-to-bes out there. c) you provide relevant, new, novel information and ways at looking at this emerging field. This is a well thought out strategy, and could be replicated by the right person if the find the right niche site at the right time. One of the best post I’ve read about buying sites. Yaro, I’d like to chat with you about a blog I’m considering buying for $250,000. No, I’m not kidding. Shoot me an e-mail, if you have a chance. Hi Yaro! You really inspired me to buy and sell websites. It is really very interesting. I didn’t know that you can earn so much by buying and selling websites. Nice article. I was wondering how do you go about checking out the ‘numbers’ such as traffic stats / revenue etc that are listed in the auction details? Good article. My following of blogs has waxed and waned, but yours is one I’ve always periodically popped back to catch up on. Only thing is, when I follow the whatisdominiche.com link it takes me to one of my most despised kind of page – a long sales letter. Yes it’s more pleasant to read that most, but I automatically mistrust anything presented in such a format. @Caroline: Wow, you’re brave taking the leap into the unknown with so little backup! I myself have also just quit my job, but I had a (tenuous) plan in place (leased an existing business closer to our life’s hobby/passion). Was a bit of a change jumping from computer programming to retail sales in pet products, but so far I have no regrets. @Ben, it sounds drastic but it’s not quite that bad 🙂 I’m putting out a podcast on my blog tonight where I talk about that. I’m also a computer programmer – must be something about programmers becoming entrepreneurs! Though I actually want to make a living with software. Very interesting read! Thanks for sharing 🙂 Wish I had that sort of money I could invest into a site! You do need to reinvest some of your income as you say. Buying under monetized, developed websites is great for building passive income. I paid $2500 for just the domain name australiaforum.com. I have since put the site together and now creates a little bit of passive income. That was a great pick up getting these sites. I recently bought a sudoku site on sitepoint, but having problems with the script on my host. Is $2000-$20000 a good range, should we use this as a guage? This is certainly a motivational post. I’m ready to start now. I guess it’s time to crack open my piggy bank and see how much cash I have to spare! Thank you for the excellent write up!! Jon that’s a crazy amount for a blog – I hope it’s got some good numbers. I don’t see your email there so if you do want to get in touch with me, use contact info listed at the top of my site. I think you are making some smart business moves Yaro. I like how you brought in someone to watch the sites and work on improving the monetization. I think Rob will really help you out as you purchase more sites. Thanks for your informative site. Wow what a great idea! It would seem though that just looking at the auctions that people could inflate what they actually make off of the sites. How did you go about making sure that they actually make money? If you split your money off of the site with a partner, you might need to multiply this a few time over to make a good living off of them because they would come and go over time. Very Interesting articles I have ever read before about buying sites. Its really an amazing post and felt happy after reading this post. You’ve showed me a new avenue to make money online!! Let’s not forget that you can also make money by buying a brand new domain that no one else has and then selling it. This is difficult because you really have to be on trend (and in some cases, on “fad”), but this is something that I will be trying in the next few months. I seem to have a bit of a knack for picking good ones, so we’ll see how it goes. This is a great success story that I would like to be able to replicate but without having that kind of start up capital, would creating a niche site new be able to produce similar results over the long term? Yaro, this post alone has made me decide to purchase a blog for the first time. I currently run two blogs with a small amount of traffic, but that will all change soon hopefully. Keep bringing on the good info! Thank you! I’m into website flipping (you can read about it in my blog) – and your post inspired me. What do you think about buying a turnkey (but promising) site from sitepoint dot com? I see some promising new site to offer at SP. I bought a dragon site back in 2003 for $10K . I reorganized it, added adsense, advertising banners and links and the site starting netting $4000/month. I held for about 15 months and ended up selling it for $120,000. The strategy of buying and refurbishing is a great one especially when you can clearly see the current owner has no clue! Wow some excellent real life information, your blogging rocks and so does the information, Keep u pthe excellent work. Anyone know where the best place to buy and sell web sites is, im looking mainly for UK based web sites? I’m a fan now. Superb article. Thanks. Great article. I’m really interested in dipping my toes in the water buying a website for around $2000 minimum. Ideally I’d like a product/service based site, as I think there’s more potential. Your thoughts? Also, what would be great is if there is some kind of syndicate where people club together and put in $1000 each and 100 members can buy a $100,000 site or 5 $20,000 sites and so spread the risk. What do you think ? Hi Yaro great article! For all the sites you bought, do you list them under a DBA for each site and then have an overall umbrella S corporation? All just under my one company Resi. I can identify with the sentiment that starting from scratch takes a LONG time and a LOT of effort.Strangely, I’ve had some small blogs with only 1000 visits a day make more than huge blogs with 80-100k visitors a month. I’ve never considered buying a cash flow positive site before, but after reading this I’ll give it some thought.